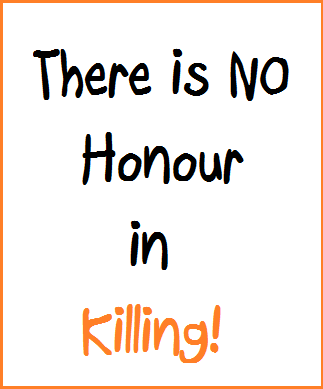 What's the honour in killing? Kanchibai was to be married off to a cousin, but she couldn’t stand the idea. The proclivity for her family to force on her an incestuous bond in matrimony was far too much for her to accept, far too wrong for her to tolerate. Kanchibai was educated at the volunteer school that some city-people had set up for her village. Though she was not as educated as her brother was, she still understood the wrong in allowing the marriage to take place. Kanchibai’s heart was with another, anyway, and marrying him was the only prospect she was willing to consider. So she devised a plan - she would run away on the eve of the wedding. A trusted friend would be her aide, and help her escape the pockmarked fate that was awaiting her. But even the truest of friends can be forced to turn foe, circumstances forcing her to be a tattle-tale. That night, Kanchibai was killed by her brothers, uncles and father. Because the family’s honour is of utmost importance; Because a runaway bride is a prospect about a thousand times worse in comparison to a dead one; Because they can. In the past year alone, scores of Indian women were killed, all in the name of honour. They allegedly shamed their family, and by bringing their family disrepute, death was their decided punishment. India has reported over 1,000 cases of honour killings every year. And 900 incidents of such honour killings are reported from three Indian states alone: Haryana, Punjab, and U.P. But what is the honour in killing? How could these men justify the killing of their women, all in the name of “honour”? Rather than to live a life with stigma, the insinuation of such logic in the hope of quelling any plausible dishonour stemming from a woman’s choice of standing for herself, or from a woman’s pursuit of a relationship with a man of her choice, is absurd. Outrageously so, at that. Honour killings are a reflection of a society that is steeped in an uber-conservative mindset, and deeply entwined an ego-centric misunderstanding, wherein women are construed emblematic of their familial honour, through their behaviour and conduct in the public eye. Any ‘misconduct’ therefore, is a depredation of the family’s honour and pride, and needs to be prevented at any cost. The dishonour can be dispensed with, and honour can be restored only if the offending female is tossed off the cliff. he perpetration of such an act is a product of misguided and ill-gotten values. The confluence of a politically liberal environment coupled with misinterpretation of religious texts as sanctioning the act by a couple of zealots is an unholy, heady mix. You cannot hope to be politically or religiously liberated if you fail to understand that social liberation goes alongside the both. Honour lies in respect, in perseverance, in honesty and in humanitarian conduct. And when you kill, there’s nothing more dishonour than that.